Next Plant for the Planet Academy on Bainbridge! Since 2013 Climate Change For Families has helped student Academies in Olympia, Orcas, and Whidbey Island, plus 6 in Seattle. At the Academies new students learn from past students and wow, is it Fun! Children get to learn important facts about the causes and effects of the climate crisis and what children are doing to solve it around the world as Climate Justice Ambassadors, members of a global children’s network, who make a real difference by planting trees, talking to leaders, conserving energy and inspiring people to care and to act now for their future. 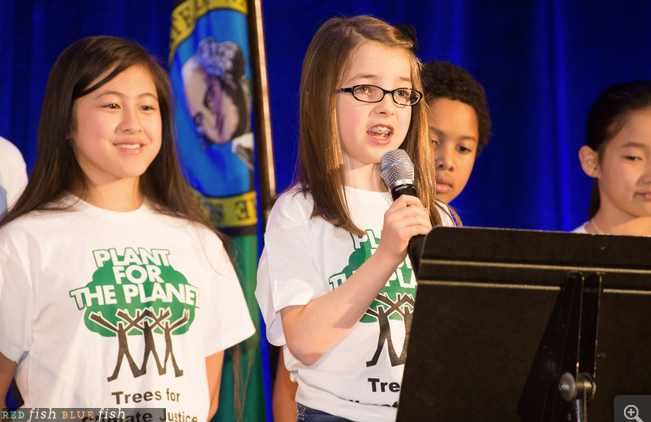 During the Academy children learn about climate justice from other children, and how to deliver a climate slideshow originally made by Felix years ago, and how to properly plant trees. Ambassadors get a free Plant-for-the-Planet T-shirt and the book “Tree by Tree” so they can learn more about how we plant now to shape our future. To end the workshop, Ambassadors pledge to take one action per month, whether it’s planting, giving a talk at school, writing a persuasive letter to a decision-maker, or attending a monthly meeting where students inspire one another to come up with more creative actions to make a real difference, like lemonade stands for trees, writing songs, or giving lawmakers “climate fortune cookies”. 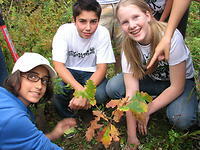 Make a donation if you like, to help cover costs and plant more trees, but volunteers and students help run the show so that participation at Plant-For-The-Planet and the Academy is always free for all children. Thank you Bainbridge Island Boys & Girls Club for allowing us to host this Academy in your beautiful new facility! And thanks to our wonderful volunteers for snacks, supplies and encouragement for our Ambassadors! Reserve your space today since it is limited. Or if you are like me — too old to be an Ambassador anymore — you can volunteer to help us guide students as we explore this fascinating, important material. If you would like to enroll as a student or offer help — organizing, leading, donating supplies or snacks — please contact me for more info. Sign up now for the Bainbridge Academy! Posted on April 24, 2015 May 14, 2015 by Kimberly ChristensenPosted in Calls to Action, For Parents, How to Get Involved, Kid Activism, Local Events, UncategorizedTagged an Ambassador for Climate Justice, Plant-for-the-Planet, Whidbey Island. I’ve always really liked the approach of this organization. I like the way it connects parents to their children in quality endeavors. I like the leadership skills it teaches the kids and I like the fact that it educates and involves them in the paramount issue that will affect their lives.